Al Jazeera reports that ambulances have finally moved into Tahrir Square, where hundreds of demonstrators are reported to be injured in clashes as supporters of President Mubarak continue to fiercely attack anti-government demonstrators with petrol bombs and sticks. CNN's Ivan Watson: "Below our window, sounds like a medieval castle seige. Men digging up stones for ammo. Wounded sreaming. Prayers." 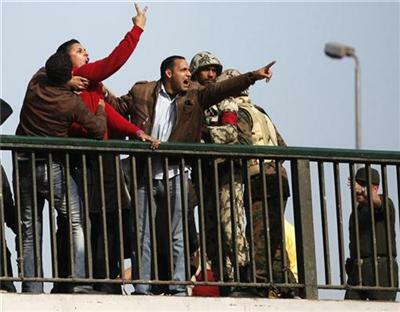 Al Jazeera's Gregg Carlstom: "There are people dropping homemade bombs into Tahrir from the surrounding buildings. Gunshots occassionally echoing across downtwon." Sky News' Tim Marshall: "Counted about 23 live fire round over about an hour in sq. Prob in air. Fighting broke out into st by intercontinental." Al Jazeera's Dan Nolan: "2 sides faced off for 15 mins, no violence just war of chants then kaboom? Don't know what exactly ignited it but boy did it turn ugly fast!" The number of people wounded in violence in Cairo on Wednesday increased to 611 from 403, the health minister said in a statement published by the official Egyptian news agency MENA. 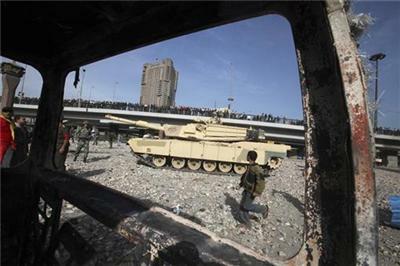 Troops made no attempt to intervene as opposing factions clashed in the vast, central Tahrir (Liberation) Square, the focus of the protests. Attackers brandished baseball bats and iron bars and broke up pieces of paving stones to throw. Earlier, pro-Mubarak youths were bussed into various districts of the capital and the carnival atmosphere of the last 48 hours turned menacing. Reuters correspondents saw dozens of injured and people fleeing in panic. 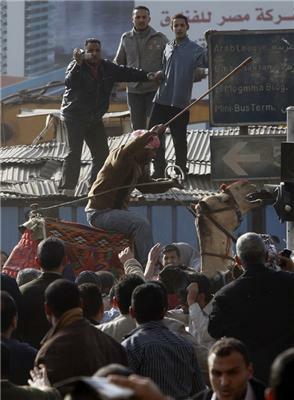 One of the riders who wielded whips and sticks as they galloped into the crowd was dragged from his horse and beaten. Petrol bombs landed in the gardens of the Egyptian Museum, an Egyptologist said. Now 4:09am in Egypt. Witness has told Reuters that Mubarak supporters have opened fire on demonstrators in Tahrir Square in central Cairo, and that seven people are wounded. 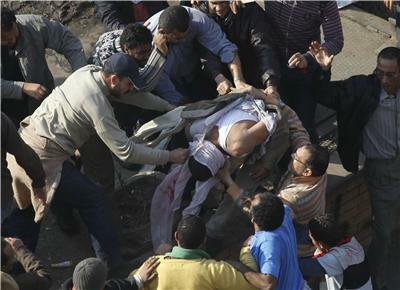 Al Arabiya is reporting that one of the protestors who was shot in Tahrir Square has died. They're quoting a doctor on the scene. CNN reporting that "heavy fire" is now being heard in central Cairo. Agence France Presse reporting 2 protesters killed early Thursday in Liberation Square. Al Arabiya, quoting doctor on scene, reporting that four people were killed and 13 wounded in overnight violence in central Cairo. It's now 5:44am in Egypt, sunrise is about an hour away. 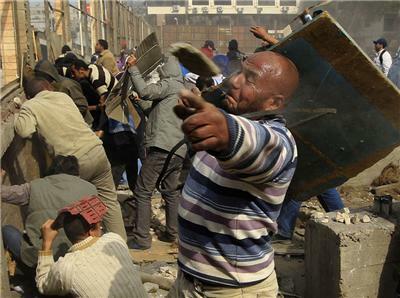 Pitched battles between demonstrators and Mubarak supporters ongoing in central Cairo. Griff Witte from the Washington Post describes how President Hosni Mubarak still has support, from rich and poor. “For eight days, pro-democracy demonstrators roared their belief that Egypt's 80 million people were ready to oust President Hosni Mubarak and start anew with elections. But the melee that unfolded Wednesday in the capital when Mubarak supporters stormed the opposition-occupied Tahrir Square suggests that there are many in Egypt who are deeply invested in the current system - and will fight to preserve it. While protesters call Mubarak's three-decade reign a disaster, a cross-section of Egyptians has much to lose when Mubarak leaves office. 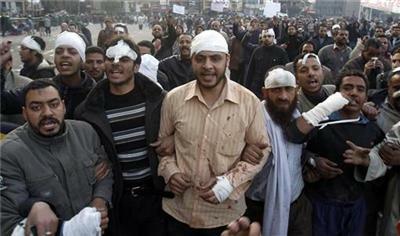 Al Jazeera reporting that Egypt’s Muslim Brotherhood demands that Mubarak’s regime be toppled. Pro-Mubarak supporters seen carrying knives, sticks moving towards Tahrir Square according to a witness. Egypt's state TV is reporting that Vice President Omar Suleiman will continue talks with the country's political parties and national forces to end 10 days of protests to oust President Hosni Mubarak. Egypt cabinet spokesman tells Reuters the government denies it was behind Pro-Mubarak attacks on protesters, describes charges as “fiction”. Egypt’s ElBaradei tells Reuters he rejects offer from Prime Minister to talk, says Mubarak must step down first. 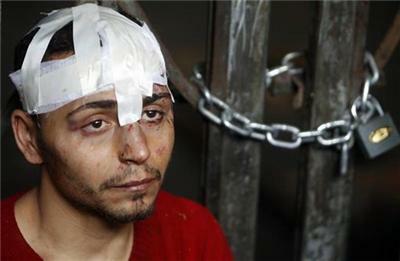 Hezbollah militant convicted by Egypt of planning attacks escapes from prison according to security sources. BBC News reporting violent clashes on the streets in Alexandria. Egyptian State TV is now reporting that the vice president says President Mubarak’s son Gamal will not run for president in upcoming elections. He also said the government is releasing all youth detained in protests who were not involved in criminal acts and will punish all those involved in inciting violence and lawlessness in Tahrir Square. While there is likely a significant amount of support for Mubarak still, the people who attacked Tahrir Square are not suggestive of it, indeed if anything the opposite, indicating that Mubarak doesn't have sufficient pop support to weather the protests w/o escalating to violence. 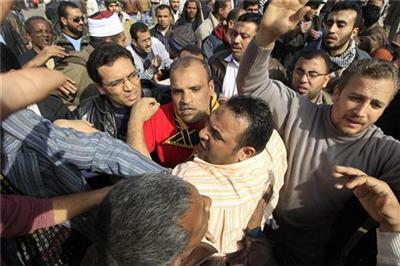 Al-Arabiya news network is reporting that Mubarak supporters are storming hotels in Cairo and chasing journalists. 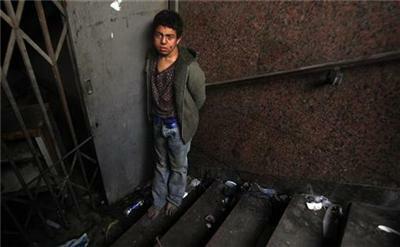 Photographer Goran Tomasevic continues to cover the unrest from the streets of Cairo. 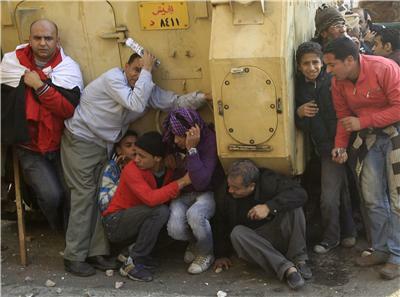 The violence in Egypt has prompted new calls from Western leaders for President Hosni Mubarak to start handing over power immediately. 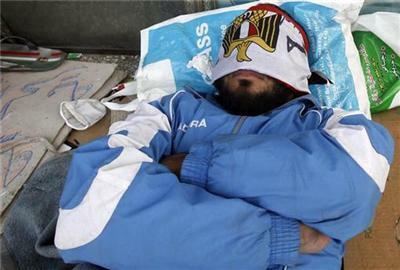 Separately, German Chancellor Angela Merkel said she spoke with President Mubarak and told him dialogue must begin now. 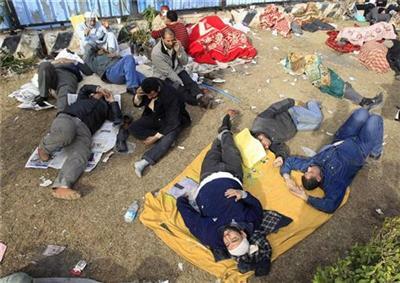 She said he must let people hold peaceful demonstrations and attacks on Egyptian demonstrators must stop. Elsewhere in North Africa, Algeria's state of emergency will be lifted in the "very near future", the official state news agency there quoted President Adbedlaziz Bouteflika as saying. He also said that TV and radio outlets should give airtime to all political parties and that lawful protest marches will now be permitted, but not in the capital Algiers.